TACLOBAN CITY – The Overseas Workers Welfare Administration Regional Office-8 officially closed an agreement with the province of Leyte for the establishment of an Overseas Filipino Workers (OFW) Help Desk including in the various municipalities in the province. 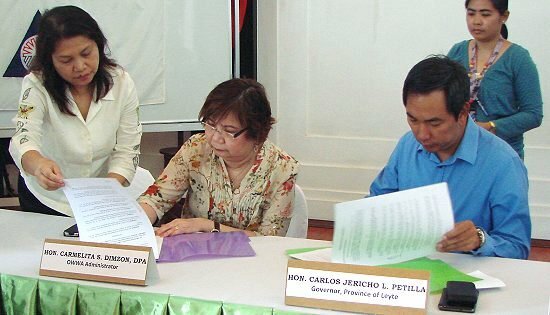 The MOA was signed by OWWA Administrator Carmelita Dimzon and Leyte Governor Carlos Jericho L. Petilla where the governor emphasized that “constant communications” between the OFWs and their families should be maintained especially with the advantages that new technology now provides. According to Administrator Dimzon, the set up of OFW Help Desk was one of the marching order of President Benigno Aquino III in looking after the welfare of overseas workers. Dimzon explained that in recognition of the importance of a multi-sectoral approach in bringing in their programs and services closer to OFWs and their families in various parts of the country, OWWA has been partnering with the different LGUs for the establishment of Migrant OFW Help Desks in every locality. She stressed that in directly linking with the LGUs through the OFW Help Desks, the government could bring its program and services closer to the OFWs and their families, down to the grass roots level. Under the set-up, LGUs will be designating a focal person for the said program and OWWA will be providing capacity building training and seminars to ensure that such focal person has the right capability and information to handle the concerns of OFWs in the area and knows how to link such concerns to concerned agencies such as OWWA, POEA and Department of Foreign Affairs. Meanwhile, Gov. Petilla said that they can likewise forge partnerships with OWWA in setting up communication centers where families of OFWs based locally can regularly connect and interact with their loved ones working abroad. The governor said present communication facilities make it easier, cheaper and faster to talk with families and loved ones abroad. “We are ready to provide them with the equipments, if this is one way that we could help,” Gov. Petilla said. CATBALOGAN CITY – The Eastern Mindanao Commanding Lieutenant General Arthur Tabaquero visited the 8th Infantry Division (8th ID) Storm Troopers Division, Camp Lukban, Catbalogan City, Wednesday, six days before he retires from an active military career that spans decades of committed and dedicated service to his calling. 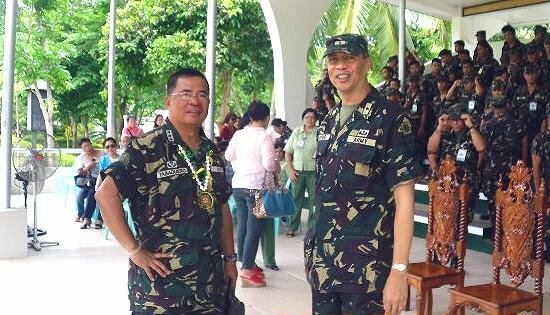 Tabaquero served as commanding general of the 8th ID (the longest serving commanding general of the division) before transferring to the Eastern Mindanao Command (EastMinCom). He will be retiring on April 17. Tabaquero, member of the Philippine Military Academy (PMA) Class 1978, will reach the mandatory retirement age of 56 this month. He assumed his post as chief of EastMinCom in November 2010. “Saving the best for last,” Tabaquero was visibly exalted as he gave his remarks. “During my two years at the 8th ID, I was able to accomplish much in so far fighting the remaining members of the rebel group, the New People’s Army,” Tabaquero said. “I have accomplished things that were expected of me as the commanding general then,” he said. “I hope that you will support your new Commanding General here as you have supported me,” he added. MANILA – Vice President Jejomar C. Binay has congratulated Jasmine Lee, a Filipina married to a Korean national, for winning a seat in the South Korean Parliament. VP Binay with Jasmine Lee during the formers recent visit to Seoul. Binay, the Presidential Adviser on Overseas Filipino Workers’ (OFW) Concerns, said Lee’s win in elections last April 11 will help advance the interest and welfare of some 50,000 OFWs, as well as all migrants in South Korea. The Vice President met Lee during a dialog with leaders of the Filipino community in Seoul when he attended the Nuclear Security Summit last March 26-27. “Jasmine Lee brings pride to every Filipino for her passionate advocacy of migrant rights. As a member of Parliament, she will surely be a strong voice not only for the Filipino community but for all migrants in South Korea,” Binay said. The Vice President recalled that during the dialog, Lee wrote down all the concerns raised by the leaders, involving employment and family concerns. "She has very strong ties to the Filipino community and you can feel her sincerity during the dialog. She might be a famous media personality and a naturalized Korean, but she is first and foremost a Filipina," he said. Lee became a naturalized Korean in 1998, three years after she married Korean Lee Dongho and moved to South Korea. Her husband died a few years ago while trying to save their daughter from drowning. Lee ran for Parliament under the ruling Saenuri Party which included her in the list of 46 candidates for the proportional representative seats in South Korea. CAMP RUPERTO KANGLEON, Palo, Leyte – PNP PRO 8 Regional Director, PCSupt Arnold Rayala Revilla warns public of the notorious “Budol-budol” gang modus operandi. On April 10, 2012 at about 3:00 PM, an 18 year old teenager was victimized by a “budol-budol” gang losing her bank savings to swindlers. According to reports, a certain Cristelle Catindoy Pombo, 18 years old, single and a resident of Barangay Songco, Borongan, Eastern Samar personally came to Borongan Police Station and reported that she was swindled by two (2) unidentified females. The victim relates that, after she had withdrawn P30,000 from the ATM of Metrobank-Borongan Branch, she was approached by the suspects and asked for an assistance to help them find a vehicle for hire to transport their assorted fruits to Catbalogan City. Until when they have agreed to find one and went to SSS Office located a meter away from the bank for further transactions. The suspects then asked P18,000 from the victim in exchange for entrusting to her their bag said to have contained P50,00 and instructed her to wait for their text message. Cristelle waited for three (3) hours until she decided to open the bag only to discover that it only contained assorted cut papers and realized that she was duped by the two female suspects. Elements of Borongan Police Station immediately conducted an investigation to the said place for the possible identification and arrest of the suspects but it yielded negative result. “Don’t talk to strangers, presence of mind, vigilance and report immediately to your nearest police station any suspicious acts so as not to become a victim by this budol-budol gang”, said Revilla. QUEZON CITY – Karapatan deplores and protests the Aquino government’s promotion of Maj. Gen. Jorge Segovia, commander of the 10th Infantry “Agila” Division and will soon replace the outgoing chief, Lt. Gen. Arthur Tabaquero of the Eastern Mindanao Command. Karapatan said that the promotion came at the heels of the refusal of Brig. Gen. Herbert Yambing of the Office of the Provost Marshall General of the AFP and the Philippine National Police, through Records Management Division Chief Manuel Gaerlan, CEO VI, to locate and provide information on Segovia and other respondents both from the AFP and the PNP such as Col. Cristobal Zaragosa, Col. Aurelio Baladad, Lt. Col. Jaime Abawag, Maj. Manuel Tabion and P/Supt. Marion Balonglong. The Segovia promotion shows the Aquino administration’s stance in pursuing justice for victims of human rights violations under Arroyo. This is the same reason why the health workers, together with other victims and their relatives, have taken up the task to file the countercharges against Arroyo and her top military and police officials, instead of waiting for the still-unfulfilled campaign promise of Aquino,” she commented. Aside from Segovia, Zaragosa, Baladad, Abawag, Tabion, Balonglong and former President Arroyo, former Defense Secretary Norberto Gonzales, Gen. Victor Ibrado, and Gen. Delfin Bangit. Enriquez likewise scored Aquino’s tolerance on GMA’s generals. “Aside from promoting Segovia, the Aquino government is annoyingly lackadaisical on the arrest of former Maj. Gen. Jovito Palparan, Jr. Palparan was charged with serious illegal detention, kidnapping and other rights violations against Karen Empeño and Sherlyn Cadapan, two UP students who remain missing to this date. “Almost four months after the issuance of warrant of arrest against former General Palparan, Jr., he remains scot-free from arrest and prosecution. This kind of “Noynoying” is gravely insulting to the victims and their families, to say the least,” she concluded. CAMP RUPERTO KANGLEON, Palo, Leyte – PNP PRO 8 Regional Director PCSupt Arnold Rayala Revilla is on a fast track mode to collar and arrest perpetrators in its intensified campaign against illegal drugs. Operatives of Tacloban City Police Office led by PCInsp Santi Noel Gaspang Matira arrested a 35 year old male for drug possession during a buy-bust operation conducted on April 9, 2012 at about 10:30 PM along Maharlika Highway fronting Villa Leonardo Inn, Barangay 1, Abucay here, reports said. Reports identified the suspect as one Dominador Robasto Omega alias “Jun Omega”, 35 years old, widower, jobless and a resident of Saint Andrew Subdivision, barangay 78 Marasbaras, Tacloban City. A police officer posed as buyer bought from Omega one (1) small sachet of suspected “shabu” marked as “DO-1”. Also recovered from his possession and control a caliber .45 magazine assembly loaded with six (6) live ammos, cash amounting to P2,582.00, a unisex wallet with driver’s license and Sangguniang Barangay Member Identification Card of Dominador Robasta Omega Jr. and a photocopy of an OR-CR. Suspect is now detained at the Tacloban City Police lock-up cell and a case for violation of RA 9165 (Dangerous Drugs Act of 2002) and RA 8294 (Illegal Possession of Ammunitions) are now filed in court against him. The PNP is set to clean the region against all forms of criminalities, if not all, at least minimize and be in control against this menace. MANILA – Vice President Jejomar C. Binay today slammed the “hypocrisy” of some officials of the Liberal Party (LP) for their "desperate attempt" to link him to former president Gloria Macapagal-Arroyo. "Look who's talking. Those who are saying those things now were rabid supporters of GMA before. Hindi ba dati lagi kayong 'Yes mam, Yes GMA'? Ngayon akala mo kung sinong mga nagmamalinis," the Vice President said. “Nagdanas ako ng malaking hirap. Yung hirap na pinagdaanan ko kay GMA – patong-patong ang aking kaso tapos ako pa ngayon ang pinagbibintangan,” he said in a separate interview with ANC. Binay clarified that they have no plans of forming an alliance with Mrs. Arroyo or her party. “UNA is about ending politics as usual, that after the election, talunan ng bakod sa administration party,” he said. “Elections are about choices. No party can claim monopoly of good intentions and good people willing to serve. This is the essence of democracy,” he added. Binay said some of those sowing intrigues were once rabid supporters of Mrs. Arroyo. “E kung sino man sila, nakita ko kayo ‘Wow GMA! Mahal na mahal ka namin, GMA. GMA, ikaw ang tunay na nanalo.’ Kayo po yun ah. Hindi po kami yan. Ngayon ang lakas ng loob niyong pagbibintangan niyo kami diyan,” he said. 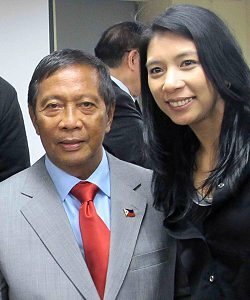 Binay headed the United Opposition (UNO) during the Aquino administration while the LP was part of the administration coalition that voted against the first impeachment complaint against Mrs. Arroyo over the "Hello Garci" wiretapping scandal, which disclosed massive cheating during the 2004 presidential elections. "Where were they when FPJ was being cheated? Where were they when we in the opposition were being harassed by the Arroyo administration?" he said. The Vice President was persecuted during the Arroyo administration, with the Department of the Interior and Local Government and the Office of the Ombudsman attempting to suspend him in October 2006 and May 2007. Binay had defied both orders. He also chided the said LP officials for sowing intrigue between him and President Benigno Aquino IIII. “Nakalimutan na yata nila na I am part of the Cabinet at 100 per cent ang suporta ko kay Pangulong Noynoy,” he added. The Vice President is the Chairman of the Housing and Urban Development Coordinating Council (HUDCC) and the concurrent Presidential Adviser on OFW Concerns. He also chairs the government’s anti-illegal recruitment and anti-human trafficking task forces. Binay said he owes a debt of gratitude to President Cory Aquino for naming him mayor of Makati after the 1986 EDSA Revolution. “Ako naman ay uulit-ulitin ko sa ating mga kababayan - kinikilala ko pong malaking utang na loob na kung ano si Jojo Binay ay nagsimula po naman ito kay Pangulong Cory Aquino at sa kanyang family. So ako po ay isang taong marunong tumanaw ng utang ng loob,” he told ANC. He also recalled having dinner with the President in Malacanang Tuesday night and attending a meeting until 11 pm, and he never felt any unease between him and the President. Binay said the sudden “inquisition” from the LP was apparently prompted by the creation of the United Nationalist Alliance (UNA), which will field a senatorial ticket in the 2013 elections. “I understand pinasasagot ako. Ano ba ito- inquisition? That I have to answer? E ano naman ang answer ko e obvious naman yun. I will repeat what I said. Mahirap magpaliwanag sa mga nagbibingi-bingihan. Mahirap namang magpakita sa mga nagbubulag-bulagan,” he said on ANC. He said that those who were forcing the issue were “insecure” of the names being included in the UNA line up. “Kaya ho kung merong United Nationalist Alliance na amin pong coalition, ito po ay nagpiprisinta ng mga tao na may kakayahan, gustong maglingkod sa bayan. Di po pa nakatutuwa na maraming pagpipilian. Kesa naman ho sa totalitarian countries na iisa lang ang kandidato,” he said. Moreover, the Vice President reiterated that the text blast messages that were sent out on Good Friday and Black Saturday being were not from him or his camp. “Hindi naman kami siguro ganoon kahina ang kaisipan na magpapalabas kami ng mga ganoong statement,” he said. QUEZON CITY – Following results of the 2010 Population and Housing Survey by the National Statistics Office (NSO), a group of leading reproductive health (RH) advocates calls on Congress anew to pass the highly clamored RH bill. Ramon San Pascual, Philippine Legislators Committee on Population and Development Foundation (PLCPD) Executive Director reminds Congress of its obligation to enact a law that will institutionalize the provision of a comprehensive reproductive health education and services. “The figures revealed by the latest NSO census, underscores the need for a firmer and more comprehensive provision of RH education and services,” said San Pascual. “These figures say that all the more, the government needs population and development planning, which can be provided through an RH law,” he explained. The Philippines population growth rate of 1.9 percent, which is still one of the highest in Asia, is the result of the absence of comprehensive RH policy aggravated further by the lack of access to family planning education and services by the poor. San Pascual notes that the Philippines could manage our population growth rate if our lawmakers and policymakers will bravely address the issue of unplanned and mistimed pregnancies by providing RH education and services. “It is expected to see population growth rate going down, but we should not look at the figures per se. We should understand that population is still growing fast,” he said. “And the fact is, more babies are born from poor families, from those who do not have access to comprehensive RH education and services,” he stressed. The controversial House Bill 4244 or the “The Responsible Parenthood, Reproductive Health and Population and Development Act” and its Senate counterpart SB 2378 are awaiting approval on second reading in both chambers of Congress. Said bill is endorsed by the academe, interfaith based organizations, labor and employers group, women, youth, peoples, and civil society organizations.